So this is a follow up to my post a while ago, talking about how to use the Google Speech Recognition API built in to Google Chrome. Since my last post, Chrome has had some significant upgrades to this feature- specifically around the length of audio you can pass to the API. The old version would only let you pass very short clips (only a few seconds), but the new API is a full-duplex streaming API. What this means, is that it actually uses two HTTP connections- one POST request to upload the content as a “live” chunked stream, and a second GET request to access the results, which makes much more sense for longer audio samples, or for streaming audio. I created a simple PHP class to access this API; while this likely won’t make sense for anybody that wants to do a real-time stream, it should satisfy most cases where people just want to send “longer” audio clips. Before you can use this PHP class, you must get a developer API key from Google. The class does not include one, and I cannot give you one- they’re free, and easy to get just go to the Google APIs site, and sign up for one. Audio can be passed as a filename (by prefixing the ‘@’ sign in front of the file name), or by passing in raw FLAC content. The second argument is an IETF language tag. I’ve only been able to test with both English and French, but I assume others work. It defaults to ‘en-US’. The third argument is sample rate, it defaults to 8000. This entry was posted in Development, Speech Tools and tagged chrome, google, PHP, speech, speech-api on 2013/07/11 by mike. I’ve posted an updated version of this article here, using the new full-duplex streaming API. 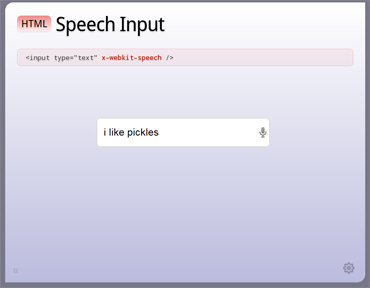 Just yesterday, Google pushed version 11 of their Chrome browser into beta, and along with it, one really interesting new feature- support for the HTML5 speech input API. This means that you’ll be able to talk to your computer, and Chrome will be able to interpret it. This feature has been available for awhile on Android devices, so many of you will already be used to it, and welcome the new feature. Genius! but how does it work? I started digging around in the Chromium source code, to find out if the speech recognition is implemented as a library built into Chrome, or, if it sends the audio back to Google to process- I know I’ve seen the Sphynx libraries in the Android build, but I was sure the latter was the case- the speech recognition was really good, and that’s really hard to do without really good language models- not something you’d be able to build into a browser. It looks like the audio is collected from the mic, and then passed via an HTTPS POST to a Google web service, which responds with a JSON object with the results. Looking through their audio encoder code, it looks like the audio can be either FLAC or Speex– but it looks like it’s some sort of specially modified version of Speex- I’m not sure what it is, but it just didn’t look quite right. If that’s the case, there should be no reason why I can’t just POST something to it myself? I’m not sure if Google is intending this to be a public, usable web service API, but it works- and has all sorts of possibilities! This entry was posted in Development, Speech Tools, Telephony and tagged api, chrome, google, speech on 2011/03/23 by mike.